Change up your morning routine with this simple, delicious parfait. This quick recipe makes a great breakfast, mid-day snack and light lunch. Try placing this parfait in the freezer for 10 min for a healthy, frosty late night snack. Enjoy! 1. In 4 small glasses, add yogurt and berries. 2. Spoon 2 Tbsp of yogurt into each glass, smooth surface. 3. Spoon 2 Tbsp of granola over top, smooth surface. 4. Spoon 2 Tbsp of fruit over top, smooth surface. 5. Repeat the process, adding honey and cinnamon & sugar here and there to taste. Try these tasty fresh fruit options: strawberries (hulled and sliced) raspberries, blueberries, bananas (fresh or dried), mandarin oranges, mango, and peaches, peeled and sliced. What’s a better balance than fresh strawberries, whip cream and a sweet, moist shortcake underneath? Indulge on this inexpensive, easy gluten free snack the whole family will enjoy. I brought this into work the other day and the whole bowl was gone within minutes. This is a great treat to bring to parties or keep to yourself for a bedtime snack. 1. Preheat oven to 250°. Grease a large roasting pan. Pour puffed corn into pan. 2. Melt butter in large saucepan. Stir in brown sugar, corn syrup and salt. Bring to a boil, stirring constantly for 5 minutes. Remove from heat. Stir in baking soda; this will cause the mixture to thicken and rise. Stir in vanilla. 3. Immediately pour caramel over puffed corn in prepared large roasting pan. Add pecans and mix well. 4. Bake for one hour, stirring every 15 min. Remove from oven. 5. Cool completely on wax paper. Break up any clumps and store in tightly covered container. We eat a lot of ice cream at our house, so I saved a few of the 1 gallon ice cream containers to store snacks like this one in. 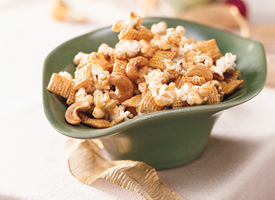 This makes the delicious puffed caramel corn simple to store and easy access. Enjoy! This moist, refreshing dessert is easy to make and perfect for any event. After spending a summer in Mexico, I fell in love with fresh, homemade guacamole. After trying many different variations, this recipe has become our family’s favorite. 1. Cut avocados in half. Remove seed. Scoop out avocado from peel and put in mixing bowl. Mash avocado with fork. 2. Add chopped onion, cilantro, lime or lemon, salt and mix together. Keep tomatoes separate until ready to serve. Add salt to taste. 3. Drizzle with olive oil if desired and serve with tortilla chips. Serve immediately or cover surface with plastic wrap and chill up to 2 hours. Feel free to adjust the amount of ingredients. Start with this recipe and adjust according to your taste. This meal is one of my favorites, and has always been a real crowd pleaser. This gluten free recipe makes a great side dish to share or a fulfilling, healthy lunch. 1. Remove unpopped kernels from popcorn. 2. In large bowl mix popcorn, cereal and peanuts. 3. In medium bowl microwave butter, brown sugar, corn syrup and vanilla for 2 min, stir after 1 min, until mixture is boiling. 4. Pour over cereal mixture, stirring until evenly coated. 5. Microwave on high 5-6 min, stirring well every min. Spread on wax paper to cool. Stir the Crunchy Caramel Corn Chex occasionally on the wax paper to break up the mix. Enjoy! This recipe is the perfect treat for any occasion. This traditional recipe is great delicious and easy to make.